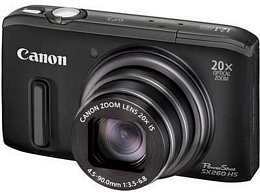 The PowerShot SX260 HS is Canon’s latest compact travel zoom camera, replacing the SX230. The SX260 offers a number of impressive improvements including a new zoom lens that is wider and more powerful than its predecessor. The SX260 features the same 12.1 Megapixel CMOS sensor as its predecessor, although it features the new DIGIC 5, a larger lens focal range (up to 20X zoom), a faster burst rate (10.3 frames per second) and a 4:3 LCD aspect ratio for its three-inch screen. Compared to the SX230, the SX260 offers a more streamlined appearance thanks to its redesigned compact form factor. The SX260 features a robust metal body that gives the camera an extraordinarily solid feel, one that suggests a high-quality product. The flash, stereo microphones and speaker are located at the top of the body. The GPS portion that once protruded prominently at the top of the camera is now integrated into the camera body. The power button was also relocated from the back of the camera to the top. All of the buttons now fit flush with the camera body. Canon also replaced the 16:9 widescreen aspect ratio of the three-inch LCD display with a more conventional 4:3 aspect ratio, which makes it much easier to view and compose photos. The new 20X lens is the most prominent feature of the SX260. It offers a more powerful telephoto zoom – the equivalent of 25 – 500 millimeters in focal length. The major trade-off is the F3.5 – 6.8 lens, compared to the F3.1 – 5.9 lens on the SX230. The higher lens aperture range makes it perform worse in low-light conditions, although the pop-up flash located to the upper left of the lens attempts to make up for it, with a working range of 0.5 to 3.5 meters at wide-angle and 1.0 to 2.0 meters at telephoto. Canon offers a slave flash sold separately with a range of up to 30 feet for more demanding situations. The SX260 offers a 10-percent increase in battery life over its predecessor. However, at 230 shots via the CIPA standard of battery life, its overall battery life remains on the lower end of the performance scale. The SX260 manages to edge out cameras such as the Nikon Coolpix S9300 and Olympus SZ-31MR iHS by 30 shots, yet it falls flat when compared with similar cameras like Fuji’s FinePix F770EXR (300 shots) and Sony’s Cyber-shot DSC-HX20V (320 shots). To its credit, the NB-6L battery generates a complete charge via wall charger in under two hours, but picking up a spare battery is highly advised. The SX260 is meant more for photographers in need of a good-quality camera that offers GPS capability and excellent image quality. Photographers who are used to working with RAW image files may find the lack of format support in this particular camera somewhat disappointing. In addition, it doesn’t offer many of the fine-tuning and manual controls found on more expensive models. Nevertheless, it offers great pictures thanks to several innovative features, including the iContrast Mode that reduces highlights and brightens shadows found in photos. For $349, the SX260 HS offers a solid and well-built value for many photographers.